For this mani I painted my nails with Rimmel Salon Pro 544 Bewitch (2 coats). This polish is from Rimmel’s by Kate collection, and it’s pretty much a one-coater. This is a fantastic polish. 50p (!) very well spent! Hi there! Today’s post is about all the stuff I bought for the past couple of weeks. I’m not doing a big intro today. Here’s what I bought. 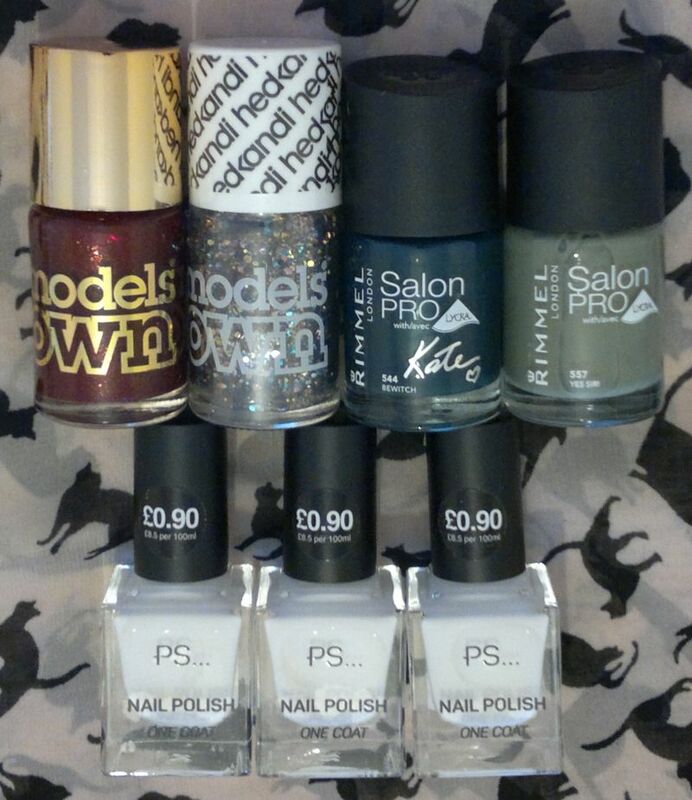 3 white Primark polishes for 90p each. 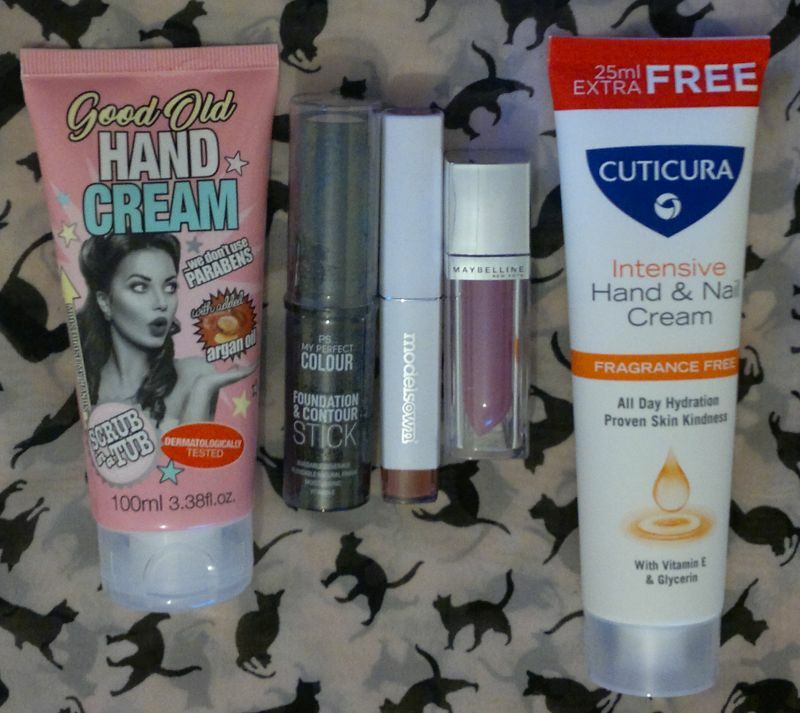 Cuticura hand cream for £1. 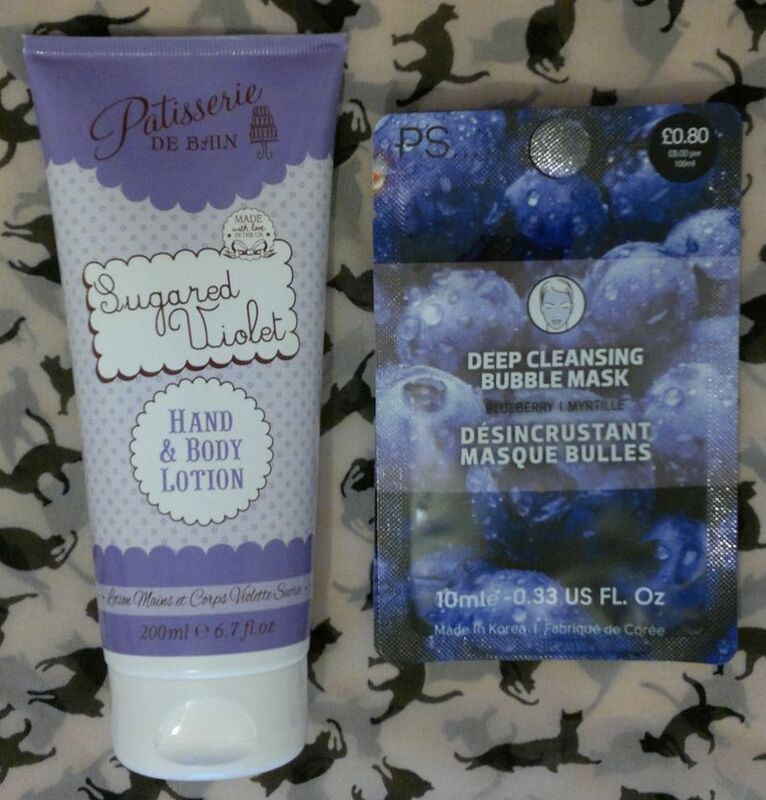 2 Primark Bubble Masks for 80p each. 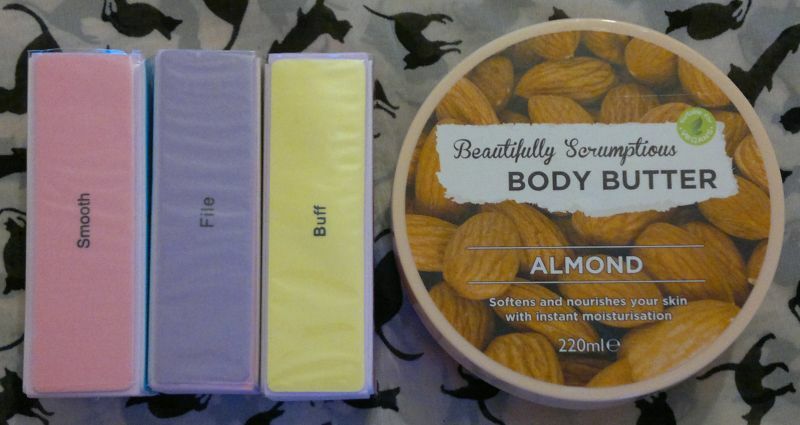 Beautifully Scrumptious Almond Body Butter for £1. 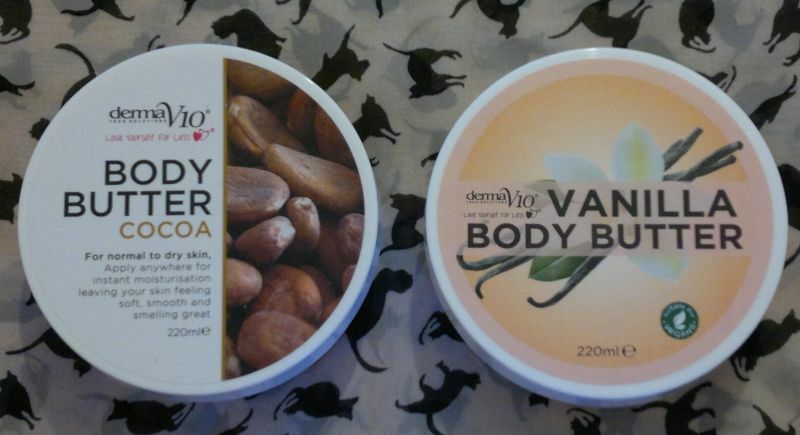 Derma V10 Cocoa and Vanilla Body Butters. These were 80p each. 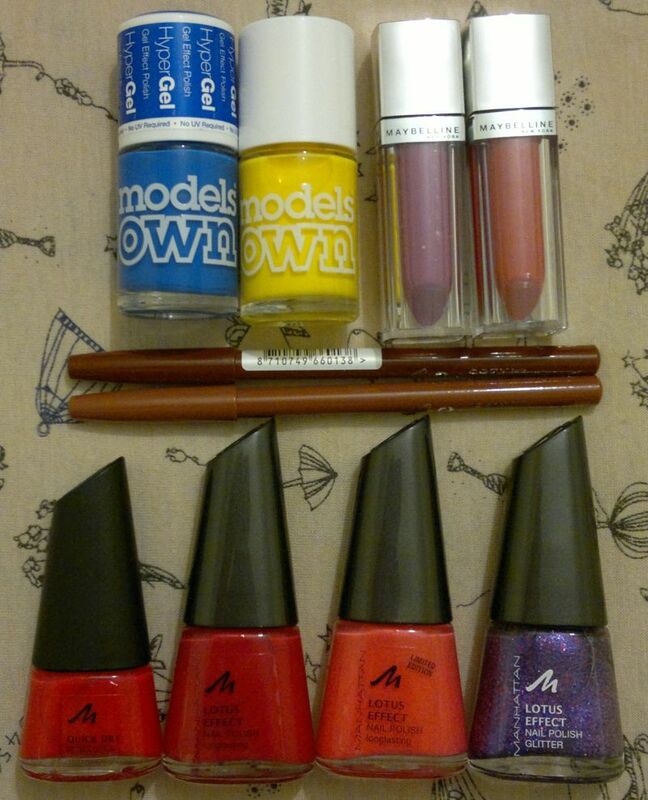 4 Manhattan nail polishes for 50p each. I found an amazing pencil case at B&M Bargains (£3.99), and I picked up 2 giant (!) 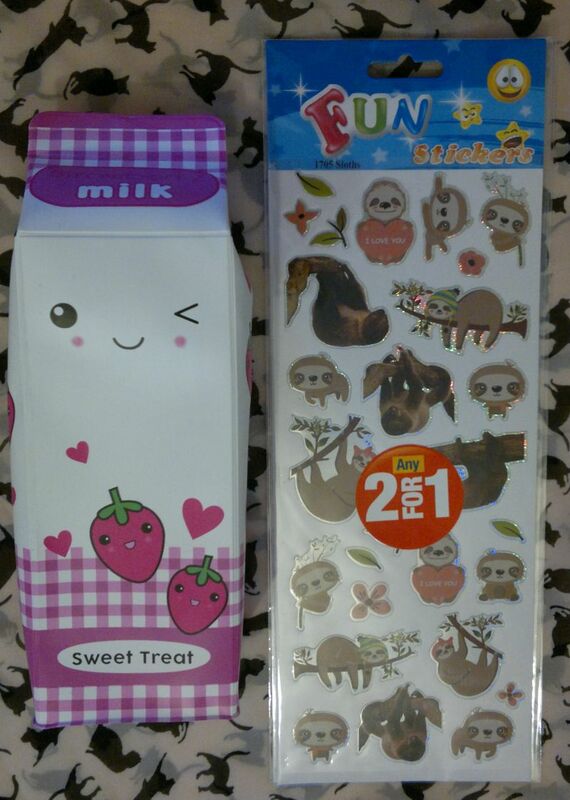 sticker sheets (2 for £1). and a Sloth 2019 Calendar for £1.50. 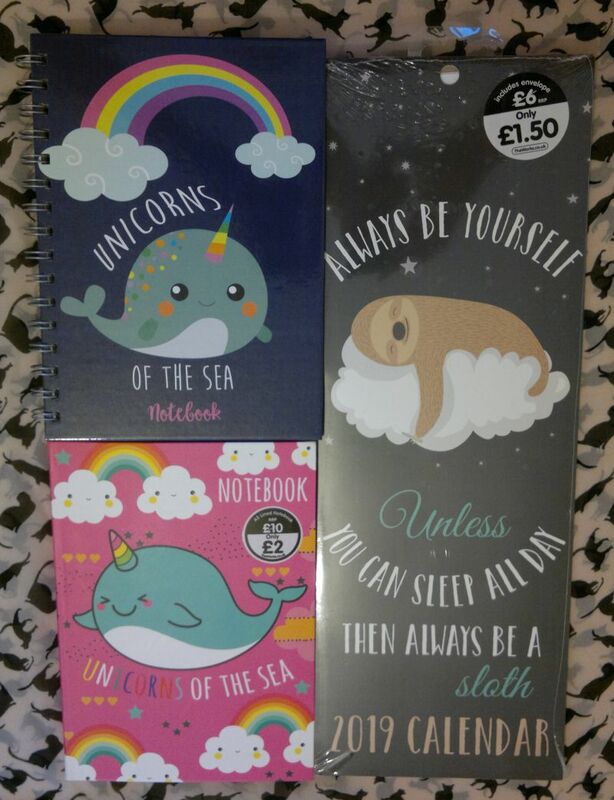 I went to B&M again the other day, and I picked up more stationery. 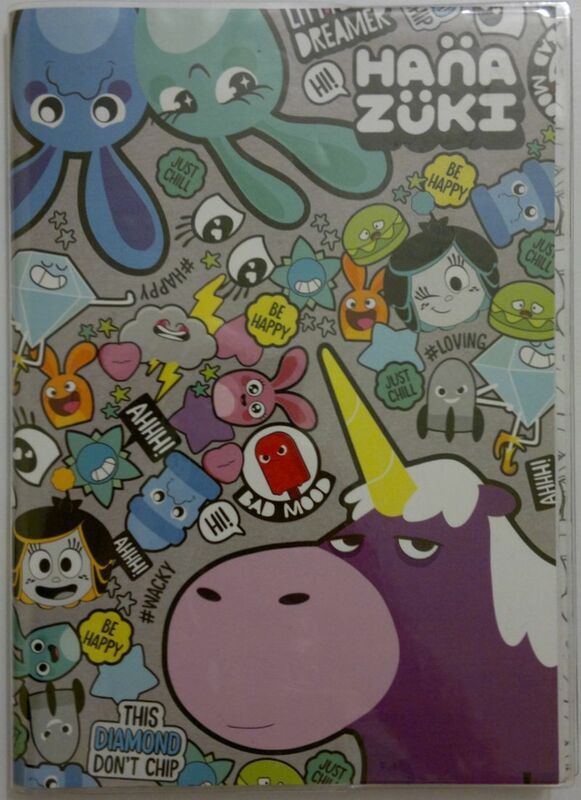 and this sensationally cute A5 Hanazuki notebook for £2.49. Hi there! This is a mani from a few weeks ago. In mid-July the UK enjoyed a few really hot summer days – and I wanted a ‘cool’ mani. I painted my nails with Astor Fashion Studio 242 Aqua Leaf (two coats). I love this fresh and cute shade. 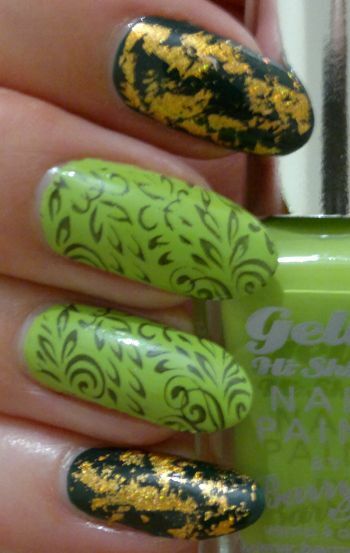 I didn’t want my mani to be too flashy – so I went for a simple green on green look. 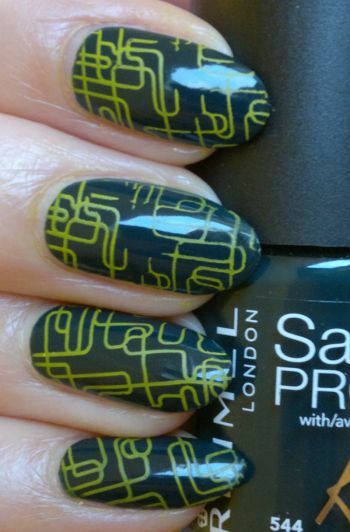 I chose Rimmel Salon Pro 544 Bewitch as my stamping colour. It’s dark green in the bottle, but it goes on as a pretty medium greeen when it’s stamped on. 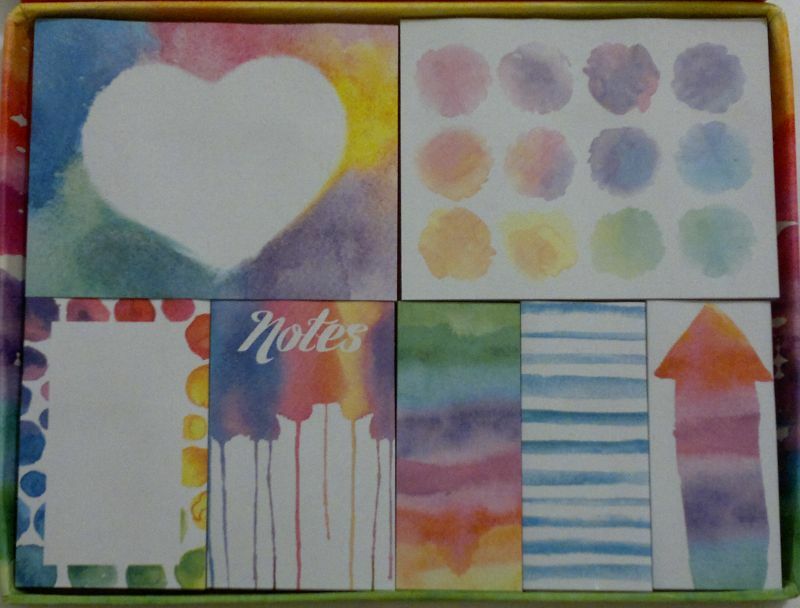 And I used my Flowers 02 stamping plate. I have no idea who makes this plate, but many online stores sell it. I really love how this mani turned out. It looked cool and fresh and it had a strong holiday vibe. 🙂 Do you agree? Feel free to let me know what you think. And thanks for reading! Hi there! A couple of weeks ago I did a foils & stamping mani. I really liked how it turned out. 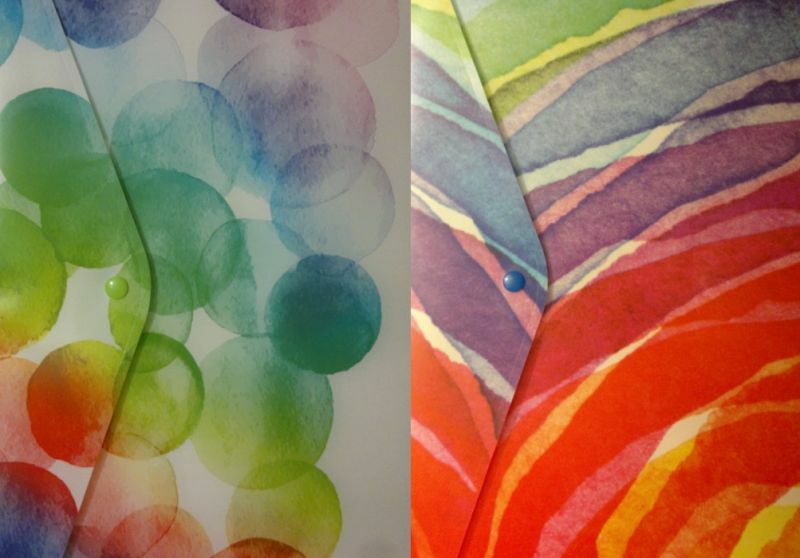 So I thought I could try something similar – but this time with green base colours. I selected Rimmel Salon Pro 544 Bewitch (index, pinky) and Barry M Gelly Hi-Shine Key Lime (thumb, middle and ring fingers) as my base colours. Both polishes were almost opaque in one coat. Awesome stuff! Then I used leftover foils to add some sparkle to the dark green polish. 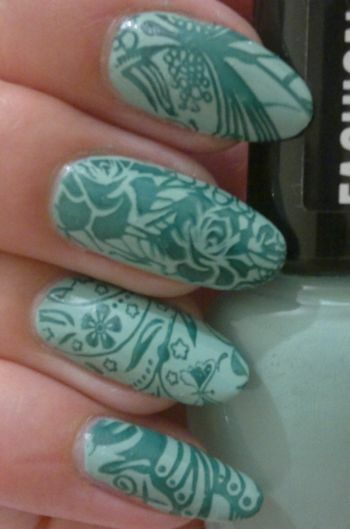 The floral image I stamped on the light green polish is from Pueen’s 76 plate which is part of Pueen’s Buffet Leisure set.